The Board of Finance discussed whether to approve $4 million for the purchase or rental of portable classrooms for the elementary schools at its Feb. 5 meeting. 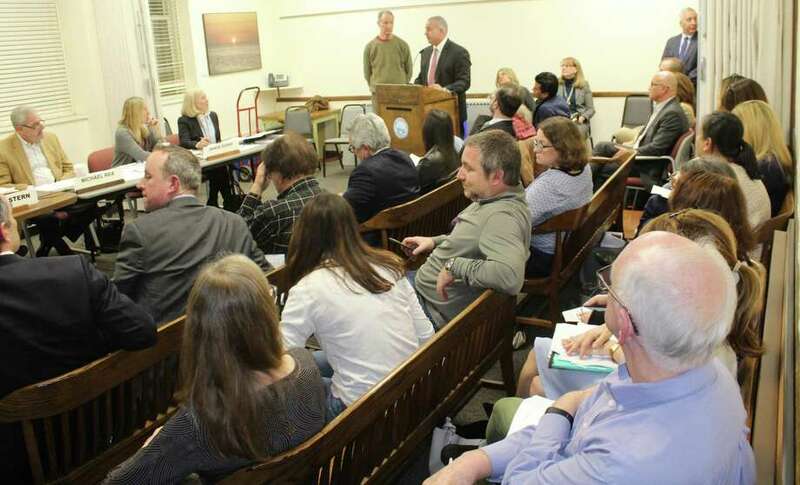 WESTPORT — The Board of Finance unanimously rejected a request to appropriate $4 million to fund portable classrooms next year, effectively killing the K-6 plan that would have housed all the town’s sixth-graders at the elementary schools. Instead, the finance board voted to appropriate $1 million to fund portable classrooms at Bedford Middle School next year, needed to accomodate the students of Coleytown Middle School which closed due to mold issues last year. “The objective is to reoccupy CMS as soon as we possibly can in a safe way,” BOF Chairman Brian Stern said. He, along with his fellow board members, argued the K-6 plan to lease 14 portables is a distraction of personnel and financial resources away from fixing the defunct Coleytown building. The amended amount of $1 million for portables at Bedford provides, “a timeline that’s the fastest possible track to get CMS up and running and the most prudent way and less disruptive way to deal with the interim year,” Stern said. In December, the Board of Education voted on the K-6 plan, and in the months since, it was revealed the portables would cost a projected $2.7 million, which is far more than the BOE expected when it approved the plan. Additionally, two independent reports suggested the timeline for reoccupying Coleytown could be shorter than the multi-year project the BOE originally thought necessary. A fall 2020 return date to Coleytown is feasible, the reports said. In light of this new information, the Board of Education voted 4-3 Monday to reaffirm its commitment to the K-6 plan. However, one member, Elaine Whitney, changed her mind to oppose the plan and said she would prefer to keep all middle school students at Bedford next year because the K-6 plan was proving to complex to execute by next year. The finance board agreed the K-6 plan was perhaps to complicated for Superintendent Colleen Palmer’s administration to execute by next fall, especially considering the aggressive timeline needed to acquire the portables by the start of the 2019-20 school year. “It just looked too ambitious, too complex, and too short of time,” BOF member Michael Rea said. Finance board member Nancie Dupier agreed the plan’s uncertainty level was too high to responsibly allocate $4 million. “I believe that with the level of funding requested, we would need a level of confidence that it will deliver the intended outcome within the expected time frame, and I don’t feel that I heard enough sitting in this seat to convince me of that,” she said. Palmer said sixth grade students would thrive more in the K-6 model than at Bedford, noting the K-6 plan is not possible without the square footage afforded by the portables. “There was a very long and involved public discourse around that vote. We talked about the quality of education. We talked about social and emotional factors. We talked about the logistics, what could be done. ... We have a plan, and I would respectfully submit that it would be a failure of leadership to sit back and try to relitigate that plan,” resident Matt Grove said. Parents who spoke against the plan said they did not trust school administration to execute it, given the uncertainties. Many said they wanted the administration to focus on fixing Coleytown instead of spending so much time engineering the K-6 plan. “The financial cost. The aggressive and unrealistic timeline and the educational disruption and challenges associated with moving to the K-6 model combined with the viability of CMS are compelling enough to support the fact that funding portables to pursue the K-6 model is not the best decision for our town. ... What will we do in August if the K-6 model is not ready and we have essentially wasted the town’s money on something that either didn’t work or didn’t work well?” parent Liz Heyer said. The $1 million appropriation request for Bedford portables will now go to the RTM for review.